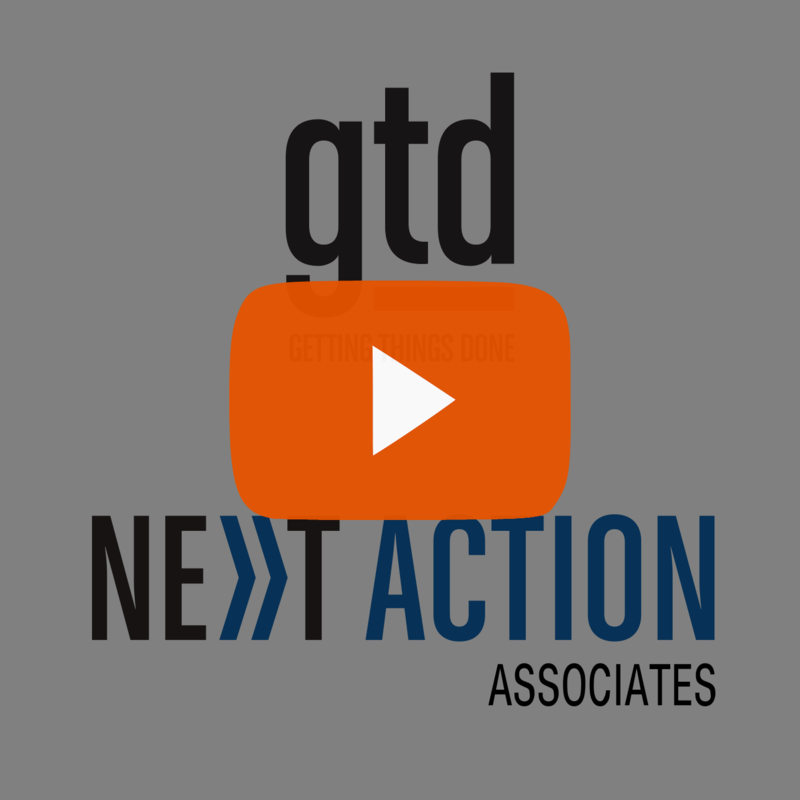 In this video, Todd Brown and Robert Peake talk about what is meant by “clean edges” in the GTD methodology, and why they are so important to stress-free productivity. 00:06 Todd Brown: Hello, everyone. My name is Todd Brown, and I am here, as always, with Robert Peake. 01:03 TB: Maybe I can kick off a little bit and talk about my own… As it were, my own journey in clean edges. When I first got exposed to Getting Things Done, the way I understood clean edges was that it was very important for a good organizational system to have clean edges. And so, what that means is that the things that mean one thing to you are in one place, identifiably in one place. And in that place are only those things so you don’t have overlap, you don’t have multiple things in the same place, and you don’t have things that mean the same thing to you distributed all over the place, conversely. And that made total sense to me. Maybe we can start there and just to revisit kind of, what does it mean to have clean edges, and maybe as well a little bit of your experience of clean edges in your own system or in the work that you’ve done with clients. What comes to mind as you think about it? 01:58 RP: Yeah, I think what comes to mind with me… The first thing that kinda comes to mind about clean edges is in my own experience there’s a cost to switching activities, switching mindsets. My training is as a computer programmer, and if you’re a good few hours in to… Hot on the tail of that latest bug and someone comes knocking at your cubicle to chide you for not putting a cover on your TPS report or whatever it is, you really can lose a lot of momentum. So for me, the very first place that GTD helped with clean edges was thinking about different behaviors in how we work. That it’s a different kind of thing to be clarifying what your options are based on email and notes to self and those kinds of things coming at you, than it is to be actually doing work, than it is to actually be thinking about where you want the results of your thinking to show up to you in relation to lists or calendar or that kinda thing. 03:06 RP: So for me, the first place that I really felt a benefit from clean edges is around the five phases of mastering workflow. And my experience with clients, often, and particularly clients that are new to the methodology or even new to this idea of thinking about how you work rather than just working harder, is that a lot… For a lot of them, the very first clean edge is between what’s actionable and what’s not. That… People haven’t always considered that the artifacts of the things in their world, the emails or the pieces of paper or whatever it is that represents things to them, they’re all kinda… They’re physical but they’re symbolic, or they’re digital. They haven’t considered that, really, those fall into two categories: Stuff I need to do something about, and stuff I may need to get back to or may just need to bin. So, that was also, for me, a real kinda major first clean edge. And the reason I think I got so much benefit and immediately got so enthusiastic about the clean edges that GTD helps you create is that I find it particularly hard to multi-task, particularly hard to switch focus and attention. I really like to be able to get stuck in to one type of activity or another. And GTD gives us this really great framework for what are the edges between those different types of activities. 05:41 TB: Yeah, no, that resonates completely and I’m with you. I think it’s an interesting question that anybody can ask themselves at any given moment. What am I doing right now? Am I capturing? Am I clarifying and organizing? Those things tend to… Tend to happen together. Am I reviewing something that’s gonna inform what I do next? So those clean edges, completely get you. But again, interestingly that was… Those kinds of mental clean edges. What activity am I currently engaged in? Those kinds of things came later to me, and I’m thinking about why that was. And it might have been because I think early on, I had, like a lot of people in large corporate jobs, I had a huge problem with email, right? And so I had… So it was something like 12,000 emails in my inbox at the time that I got started with GTD. 06:35 TB: And I remember this idea of clean edges and thinking if I had a system where it was clear to me, for example, what I needed to discuss with the boss, so what are the things I need to talk to the boss about? If I had that, if I had an element in my organizational system that contained only those things, that would be a replacement for what I basically had, which was some combination of a bunch of emails in my inbox. One of them… Six emails down, another four pages down, another 18 pages down, another 23 pages down, whatever, which represented things I needed to discuss with the boss, plus hopefully, some recollection that I’d come up with with five minutes to go before the meeting of, “Oh, my goodness, I’ve got a meeting with the boss, and what do I need to talk to her about?” So I think it was because for me, a pain point was, this sense that I was really overwhelmed by what was going on in my email inbox, quite frankly, that I started to… Where I was so struck by this idea of, a good organizational system would have these clean edges, and of course, by inference, a bad organizational system, my email inbox was a lousy organizational system. 07:51 TB: It was… And it wasn’t just that it was a mix. It wasn’t just that it was yes, things I need to discuss with the boss, trash, reference information, stuff I might do something about someday, people I need to call, emails I needed to respond to, right? So, they were all in there. And the problem with that isn’t that it’s untidy. That’s not the point. The point is it makes it really hard on you when you open your email inbox because you need to re-decide, reevaluate, re-clarify, if you will, every time you open your inbox, what do these things all mean for me? And I remember just thinking, “Wow, that is so inefficient.” If I’m leaving stuff in my inbox un-clarified with some sort of vague intent that, “Yeah, I’ll come back to this,” but if I’m leaving all that stuff in my inbox, then I’m making it really hard on my future self. Coming back to your point, GTD is, in so many ways, being kind to our future selves, and I was being really, really hard on my future self by behaving in those ways. 08:55 TB: So that’s really interesting. 09:55 RP: Just popped into my head, it’s my IT brain. 09:57 TB: I think the techies in the audience will be really… I love that metaphor, I think that’s a great metaphor ’cause it’s exactly what’s going on if you’ve got an email inbox that’s just full of an interesting collection of various things which have various meanings for you, right? So where else… As we’re talking about clean edges, something else that occurs to me is it’s not just about the… Your organizational system should have, ideally, clean edges. As you said, it gives us the opportunity to be clear about, “What am I currently engaged in?” And that has clean edges. And something else that occurred to me, and I did a blog about this not long ago, was this idea that if you think about the clarifying questions that we encourage people to ask, that gives your thinking, when it comes to figuring out what something means for you, that gives your thinking incredibly clean edges, razor-sharp questions. What is this? Is this actionable? To your point. 11:08 TB: If it is actionable, what’s the next action? Once I’ve got that, two minutes, delegate, defer. If it’s not actionable, trash, reference, incubation. So that little decision tree that we go over with people in the coaching and in the seminar, those clarifying questions, lends clean edges to the thinking process that we go through when we clarify things. And again, it’s so far away from what most people do when they’re sort of trying to figure out what something means for them. They’re fretting and they’re ignoring and they’re procrastinating and they’re not coming to a decision and it’s still sitting in the inbox and it’s… It’s hard on them. It’s hard on them. Whereas the clarifying questions allow us to… Because those questions have such clean edges, it makes us very efficient and it means that we get maximum return on the mental energy that we invest in making those decisions. So that occurred to me not long ago. That was another area in which GTD equips us with clean edges. 12:21 RP: Yeah. Absolutely, yeah. And for me, it helps me hold the focus, like, “Where am I in this process?” Because as much as I mentioned that I have a tendency to wanna get stuck into things. That computer programmer sit-for-nine-hours-and-write-a-bunch-of-code kinda mindset, I also have a tendency to get distracted, funnily enough. And nowadays, I think people are doing an awful lot of self-distracting as well. The notifications are popping up, but also, we’re going out and seeking out information that may or not be relevant to what we’re doing. So for me, as you said, that flow diagram, knowing where you’re at in the thought process, knowing what you’re doing, am I clarifying something right now, or I feel like I’ve clarified all the new inputs, it’s really time to go to work, was really helpful. 13:08 RP: But another thing that does, the results of that does for me is helps me, as you alluded to, match my efforts to what’s appropriate in terms of the rhythms of my day, of my week, of my month, or my year. And by that, I mean the obvious thing is if you move around at all, physically, and everyone, most people, go from at least home to work, if not physically at least hopefully mentally, if you work from home. So having at least those two contexts helps you say, “Okay, I’m not gonna be unduly distracted by home-related things while I’m at work or vice versa.” But really, it’s a lot more subtle than that. There are times when it’s more appropriate for me to be doing certain types of activities than others, based on mood, mental state, last conversation, all kinds of things, right? So learning how to match that, learning how to match what I’m doing to what’s appropriate in terms of my own rhythms, both physically, where am I and what do I have around and available to me, but also my mental acuity and other things has really, really helped me not only be productive, but feel just that sense of relief and ability to settle into, “Okay, this is the right thing to be doing. This is appropriate. I’m within the clean edge.” right? 14:38 RP: And there’s a certain security, I think, that comes from knowing that you’re within the right clean edge in terms of what you’re doing and the boundaries of that that you don’t necessarily have to go outside of that. And then working within it, until it’s time to then move on to another clean edge. I think, as you say, the mind trying to do 20 things at once, results in about 5% attention or effectiveness on each of those things at best, right? So I think, yeah, there’s a funny paradox of you can get stuck in confidently, but you also can… The confidence comes from feeling an appropriate match. It doesn’t come from, “I’m blocking out the world and hoping for the best.” It really comes from a natural match between the rhythms of life, and these different contexts and categories. So the cleaner they are, the more you can say, “I’m here now. I’m right here now in this part of my work-life process.” So that for me… That for me was huge. 15:45 TB: As you’re talking about that, I’m just reflecting on a conversation I had not long ago with someone who’s someone that works in a trading floor environment, right? So very, very high input. And as she was talking about her work, she was describing… It’s basically all reactive. It’s firefighting all day, every day, right? There’s very little… Strategic thinking is not rewarded. She said as much it’s just get it done, get it done, as quickly as you can. If you don’t do the trade, the client is gonna go and do the trade with somebody else. It’s just every day was this incredible… Everything is coming at you so fast. And it’s interesting, as I was reflecting on that, I was thinking that that’s an environment I know from my previous corporate life. I worked in a big financial institution for a while. 18:39 RP: Yeah, yeah, absolutely. 18:41 TB: So I think we’re kind of coming to the end… The end of our time together. I’m curious if we were gonna boil this down and give folks a couple of top tips in this area of clean edges to send them away. Now that we’re into August, maybe they’ll have a little bit more time to focus on their… On their ways of working. So what would we equip them with or encourage them to do? 19:03 RP: Well, yeah, I think we’ve talked a lot about the benefits of clean edges. So one of the ways I know that I’m slipping, in terms of that, is when I feel that I’m not quite on my game, it’s a bit of this kind of, itchy jumper kind of feeling of, “Hey I’m starting to get more distracted than usual. Things feel like, I don’t feel like I have as clear a sense of where I should be and what I should be doing in each moment.” So, if you are experiencing that and you want… And you think clean edges could be the issue, one thing, one simple thing is make sure that, in terms of your next action categories, that you don’t… As you… Just as you said, that you don’t have duplicates. That you don’t have things scattered hither and yon, that the contexts that you’re working out of really are discreet, there’s not overlap there’s not this kind of, “Well, it feels like it should go about there, or maybe here,” when you go to actually organize the results of your thinking in the five phases model. It really should be, “Okay that… That’s… This is what I’m gonna do and that goes here,” and it’s really clear and confident. 20:14 RP: So if you’re not experiencing that, definitely have a look at your context list. That’s a big place where I see people start to blur the edge and that just inevitably results in this kind of slightly itchy uncomfortable slip, both in productivity and in personal head-space. What about you, Todd, what’s your advice for people trying to create, promote, report, clean edges? 20:40 TB: I’ll tell you, what’s coming to mind for me, and again, this may just be because I’m aware that in August for many people, not for everyone, for many people, the world kind of slows down, and we’ve got a chance to do a bit of that higher level thinking. Crack out that copy of the Horizons of Focus Model that you got at the seminar or in the coaching. You can find it online if you search, “GTD Horizons of Focus,” and that is another example in the methodology of clean edges. What do I have at the, what we call the ground level, that’s the tactical stuff. The emails I need to send, the websites I need to browse, the conversations I need to have. And then, it’s a six layer model where as you go higher in the model, you go through the projects layer, which are your, what you wanna get done by the end of the year, kind of 12 months things. At the next level up, we’ve got roles and responsibilities. 21:39 TB: The point is that now is probably a really, really good time for a lot of people to be asking questions about, “What commitments do I have at each one of those levels?” “Where do I wanna be in three to five years?” That’s kind of a level four, a level four thing. Horizon Four thing. “Why am I here, why am I here on the planet?” If you wanna get really into the heavy, heavy mental lifting of some philosophical questions, you can go up to the highest level of the horizons. So yeah, again, if your world has slowed down a little bit and you’d be, you’re interested to find out to what extent you’ve got the right balance and that the… In your life and that the things that you are choosing to engage in are leading towards things which are helpful, they’re achieving the right balance for you overall, then I’d say that would be an activity I could recommend. 22:34 RP: Great. Yeah, great time of year to sharpen the sword, for sure. 22:39 TB: So, thanks everyone for being with us today. For the Change Your Game with GTD podcast, as always our goal in this is to be a source of support for you. So if there are any topics that you’d be interested in hearing us talk about in the future, please by all means get in touch and let us know. You can find us at www.next-action.eu And for me and for Robert, until next time, be well. We’ll see you next time. I enjoy your podcasts very much, so thank you for doing these. I love hearing your musings and they help put things in perspective. I have realized that it is ok to redefine, redesign, and refine ones system constantly. I am finally dedicated to fully commit to GTD and tweaking my system constantly. One of the things I would like some clarification on is the Next Action step. While I have no problem grasping the need to determine the very next step for all projects, I seem to hear all the time that ONLY the next action should be decided on. In my work I have projects that are long and complex and only determining the one next action ain’t cutting it. My inclination is to determine most of the steps needed in advance and then just assigning the next action to the next action list. Anything that can be done in parallel can also go on the next action list, but anything that has dependencies will remain on the project action list, but not on the next action list. I’m glad to hear you are enjoying the podcasts, and that they are encouraging you to constantly refine your GTD practice. Many people find it helpful to list potential intermediary steps–indeed, the mind seems to want to do this naturally as soon as you give it an outcome/project to focus upon. You’re right that keeping them as part of “project support” is ideal, so that you only end up with real next actions (not “blocked actions”) on your action lists.